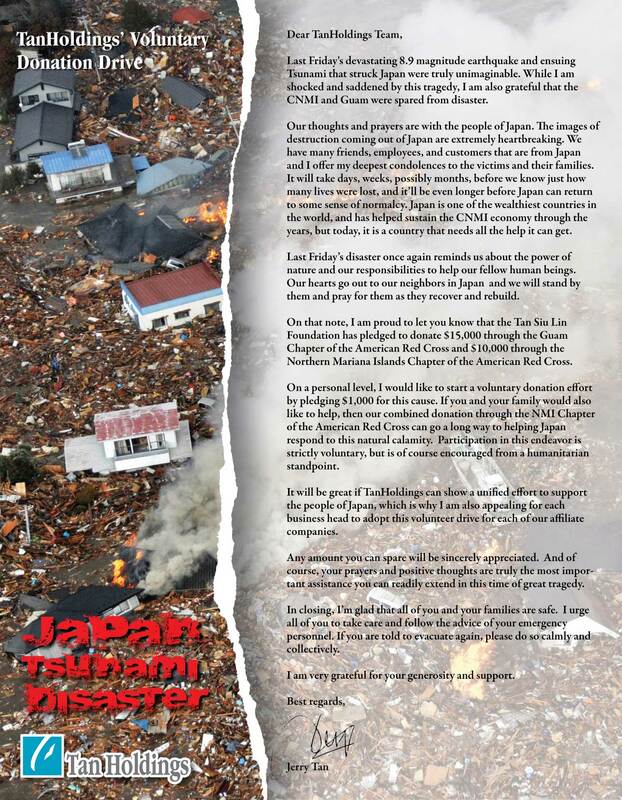 Tan Holdings President Jerry Tan expressed support to the victims of the earthquake and tsunami that recently hit Japan by donating $10,000 to the American Red Cross NMI Chapter. The donations were presented to Red Cross Executive Director John Hirsh, Board Members Jocelyn Deleon Guerrero, Jerry Facey, and Lou Johnson. Alongside this, the company also gave donations worth $15,000 to the Guam Chapter of the American Red Cross. During the presentation of the donation at the TSL Plaza, Tan reiterated the need for the CNMI community to extend their generosity to Japan because of the calamities that struck the country.